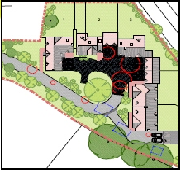 Martin Dobson Associates provide tree survey reports including arboricultural impact assessments (AIA), arboricultural method statements (AMS) and tree protection plans to accompany planning applications in situations where trees are located near to a proposed development. The British Standard 5837: 2012 ‘Trees in relation to design, demolition and construction’ has created a framework within which architects, developers and planning officers can consider the place of trees on development sites. It is frequently desirable that trees near to new developments are protected and consequently a site survey will be required to identify which trees are present on the site, their dimensions and quality. 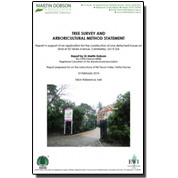 From this an arboricultural impact assessment can be produced to specify which trees should be retained and an arboricultural method statement to show how the trees to be retained will be protected from any negative impacts of the development. Martin Dobson Associates provide an appeals service in situations where applications have been rejected. The British Standard BS5837 recommends that trees should be considered as part of a planning application for development. Most local authorities have made tree surveys a compulsory requirement. 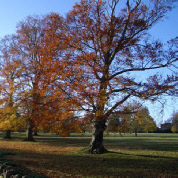 Once a tree survey has been completed an arboricultural method statement will give details of which trees should be protected and how they are going to be protected. If an application has been rejected on the grounds of tree issues it is often possible to take the application to appeal if there are good grounds to do so. Martin Dobson Associates provides reports to accompany planning applications and appeals, Tree Preservation Order applications, subsidence investigations, tree surveys and tree hazard assessments together with an Expert Witness service.